I’ve spent time designing courses over the past couple days. More correctly, I’ve been playing with handling sequences, and will figure out later how I might fit them in the context of a full course. In this bit I’m having some fun with the presentation of wrong course options. The first option is on the dismount of the teeter. The table is straight ahead with only about 10′ of real estate to convince the dog to turn to the left to jump #3. Immediately after jump #3 the dog is presented with a pipe tunnel some 20′ distant. On the dismount of the table, after jump #6 the handler has the classic counter-side tunnel trap; this is the most obvious of the wrong course options in this short sequence. 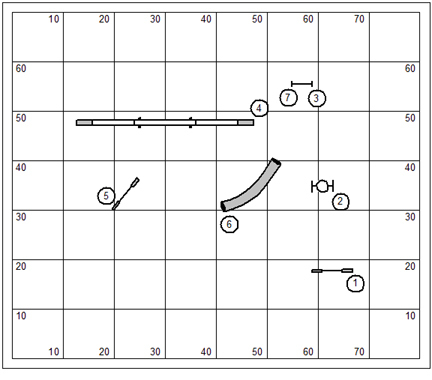 It’s followed by the least obvious of the options… the possibility of a wrong course back to the table after jump #8. Another test I’ve been interested in pursuing is the 270 wrap from jump #3 to the dogwalk. I’m assuming the clever handler will turn the dog to the right at jump #3. But I suppose there are some very small dogs who, with the aid of a skilful handler, could make the turn to the left. It’s a shame that we can’t see beyond jump #7 right now. The course designer must recognize that he’s likely trapped the handler on the opposite side of the dogwalk, attending the down contact and the turn to jump #5. So the direction of the course after jump #7 will be of great interest to the handler. On the other hand, as I wrote the above I also had this little imp whispering in my ear that I could have dog on left down the dogwalk, and then flip him away from me on the dismount, layering to the opposite side of the dogwalk. So the handler could be neatly in the picture for whatever adventure awaits after jump #7. It’s inescapable that the course designer must put himself into the shoes of the handler to find the solution, even if it is his own solution. Solving a wrong course option is a matter of communication. The dog needs a spot-on directive at the moment of choice; or better still, in the moment before choice. That would be a pre-cue. I suppose that we all have a word or a phrase that we speak either with voice or by movement, and maybe both, that informs the dog of his mission. Even as I look at the drawing I have a mental image of my movement and the small elements of timing that attend. At the same time I see my dog in motion and his every response to the choreography that I envision. A small thing could make it all wobble, a miscalculation, a wrong handling decision, or a not-strong-enough directive at the moment of choice. But I see none of that in my vision. I’ll be judging USDAA at Pet Behavior Help (PBH) in Chapel Hill, NC on May 26-28, 2012. They run a one judge/alternating rings trial. I’ve always like the folks down in that part of the world. So it should be a lot of fun. I believe I’ll be doing one or two days of seminar after the trial. 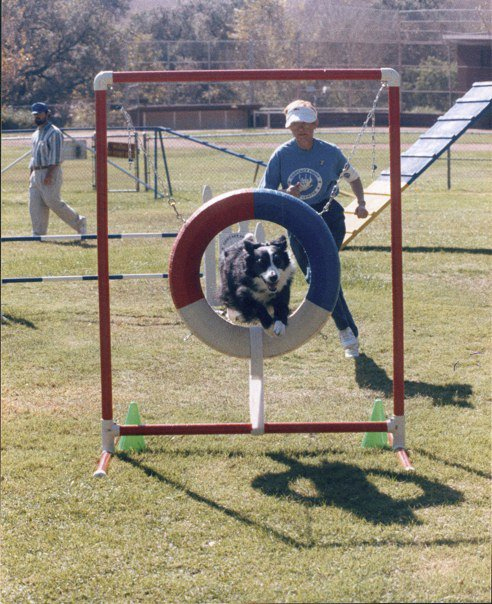 This entry was posted on February 3, 2012 at 8:31 pm and is filed under Course and Sequence Design, Distance Training, Dog Agility Training, Games and Courses, Go the Distance, Handler Training, Jokers Notebook, TDAA, USDAA. You can follow any responses to this entry through the RSS 2.0 feed. Both comments and pings are currently closed.